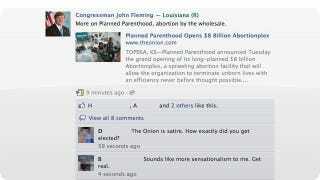 John Fleming, a Republican US representative from Louisiana, made a dimwitted mistake on his Facebook page last week. Hell, it might be even more embarrassing than naked pics! Here's what happened: Fleming missed the obvious humor of a satirical piece by The Onion and posted the fake piece to his Facebook followers as a real thing to take seriously. How did this man get elected? He linked The Onion's fake piece about Planned Parenthood's $8 billion Abortionplex (it comically describes nightclubs, movie theaters and bars inside the fake clinic), saying it was more information on Planned Parenthood and "abortion by the wholesale". THE MAN DIDN'T KNOW THE ONION IS FAKE NEWS. To top it off, that piece by The Onion was actually from May 2011 so Fleming made the grave Internet error of falling for the double whammy: OLD fake 'news'. Maybe we're missing Fleming's wit and appreciation for the lulz but Fleming posts (seriously, in these cases) about Planned Parenthood a lot. The Facebook post has now been deleted but it's still an embarrassing gaffe by someone who supposedly has a say in our government. These out of touch people run our country? Great.